for August 14th are Joyful. the job of the prophet very hard. further for evil done by them. us in baptism to spread the Good News. to be as God wants us to be. have to obey God either. HOMILY: ... The unity that our Lord talks about presupposes some leadership. Someone has to be in charge. If you asked a dozen people to interpret some part of scripture, or to tell you what God thinks about some issue, you would probably get a dozen different answers. Someone has to have the last word if there is going to be some unity, or people will be going in a dozen different directions. Christ was no dummy. He knew that. He had a dozen Apostles with him all the time and he knew some of the debates and discussions they got into. He gave Peter the job to be the rock, the source of stability, the focus of unity, the one to hold them all together. Again we get back to the need for the Church and the way Christ established it if we are going to be faithful to Christ, and not just be going off on our own. Our unity with each other is not just for our own personal well-being, but it affects in a most important way the whole saving work of our Lord. Our common belief, our common set of values, our oneness in prayer and most of all in love tell the world about Jesus. Jesus said, “I pray that they may be one in us, that the world may believe that you (Father) sent me.” The church’s mission, which means your mission as well as mine, is not just to save ourselves, but to bring God’s saving grace and life to others too. Staying united is one of the primary ways we will do it. When we all go our own individual ways, our efforts become significantly less effective. HOMILY – Since I gave a long introduction, I do not have a very long sermon. One of Aesop’s most famous fables is the story of the ant and the grasshopper. Even 2500 years ago, people knew the importance of preparing for the future. It’s still just as true today. If we do not learn this lesson when life is good, we’ll learn the hard way when it’s too late. This goes for education, investing, health and all kinds of important areas of life. John the Baptist’s role in life was to insist on the need to prepare. He called people to repent and prepare for the coming of God’s kingdom. His message is as important today as it ever was. There is a kind of new age theology that follows the attitude of the Grasshopper. It says don’t worry. Everybody is going to be in heaven in the end (except for someone like Hitler). Although God wants all people to be saved, there are abundant passages in the Scriptures that warn us that we cannot take salvation for granted. Jesus, who came to save us and who revealed to us so clearly the love of God, warned us: “The door to heaven is narrow. Work hard to get in, because many will try to enter and will not be able.” (Luke 13:23) Jesus’ message at the beginning of his ministry was the same message as John the Baptist: “repent and believe in the gospel.” The word “believe” means more than saying, “I believe.” It means putting our belief into action. Statistics keep coming out that fewer and fewer people are coming to Church, which is an indication that more and more people believe that worship of God is not all that important. I think it’s the entitlement mentality. We feel entitled to be happy (even eternally), no matter what we do or how we live. That’s not what the Scriptures tell us. I think the most important lesson we can learn from this feast of John the Baptist is to prepare. The fact you are here today is one good sign that you understand we need to prepare to meet our God. Amen. You must anoint Jehu son of Nimshi as king of Israel, and anoint Elisha son of Shaphat, of Abel-Meholah, as prophet to succeed you. Leaving there, he came on Elisha son of Shaphat as he was ploughing behind twelve yoke of oxen, he himself being with the twelfth. Elijah passed near to him and threw his cloak over him. Elisha left his oxen and ran after Elijah. 'Let me kiss my father and mother, then I will follow you,' he said. Elijah answered, 'Go, go back; for have I done anything to you?' Elisha turned away, took a yoke of oxen and slaughtered them. He used the oxen's tackle for cooking the meat, which he gave the people to eat. He then rose and, following Elijah, became his servant. Christ set us free, so that we should remain free. Stand firm, then, and do not let yourselves be fastened again to the yoke of slavery. After all, brothers, you were called to be free; do not use your freedom as an opening for self-indulgence, but be servants to one another in love, since the whole of the Law is summarised in the one commandment: You must love your neighbour as yourself. If you go snapping at one another and tearing one another to pieces, take care: you will be eaten up by one another. Instead, I tell you, be guided by the Spirit, and you will no longer yield to self-indulgence. The desires of self-indulgence are always in opposition to the Spirit, and the desires of the Spirit are in opposition to self-indulgence: they are opposites, one against the other; that is how you are prevented from doing the things that you want to. But when you are led by the Spirit, you are not under the Law. Now it happened that as the time drew near for him to be taken up, he resolutely turned his face towards Jerusalem and sent messengers ahead of him. These set out, and they went into a Samaritan village to make preparations for him, but the people would not receive him because he was making for Jerusalem. Seeing this, the disciples James and John said, ‘Lord, do you want us to call down fire from heaven to burn them up?’ But he turned and rebuked them, and they went on to another village. INTRODUCTION – (1 Kings 19:16b,19-21; Galatians 5:1, 13-18; Luke 9:51-62) Today’s gospel reading brings us to a critical point in St. Luke’s gospel. St. Luke tells us at this point in his gospel that Jesus turned his face toward Jerusalem. From this point on, Luke wrote that everything Jesus said or did took place while he was on his way to Jerusalem. This part of Luke’s gospel is referred to as the “journey narrative.” When Jesus decided to go to Jerusalem, he knew what was ahead for him; nonetheless, he started his journey with courage and determination. He warned those who would follow him that following him would require sacrifice, and there wasn’t time for second thoughts or to be indecisive. Our first reading was chosen to correspond with the idea of total commitment to one’s call. It tells about two Old Testament prophets, Elijah and Elisha, who lived about 850 years before Christ. Elijah was getting old and his life was coming to an end. At God’s command he chose Elisha to replace him. Elisha was busy farming and Elijah came up to him and placed his mantle on Elisha’s shoulders. This gesture symbolized God’s call – that Elisha should replace Elijah. It would be similar to my taking off my vestment and putting it over someone’s shoulders. The point would be obvious. The reading tells us Elijah had 12 yoke of oxen which would indicate that Elisha must have been quite a prosperous farmer. When he sacrificed his animals and burned his equipment, he was indicating his total commitment to his vocation. He broke completely with his former way of life and did not look back. HOMILY – A man rushed into the jewelry store one morning and said he needed a pair of diamond earrings right away. The clerk showed him several pairs and immediately he picked out a pair. The clerk asked if he wanted them gift wrapped. The man said, “That would be great, but make it quick. I forgot today is the anniversary of my wife and me and right now she thinks I’m taking out the trash!” (Reader’s Digest - Laughter the Best Medicine, pg 68) Time was short for the man to get home with his wife’s present. Time was short for Jesus too. He knew well what was ahead for him, and he couldn’t even wait for a man to bury his father. I often wondered if the situationwas such that the man’s father was fairly healthy and it might have been many years before his father would die. Jesus didn’t have that much time. Our gospel today begins by telling us Jesus was determined to journey to Jerusalem. He knew what to expect when he got there. He predicted: “it is impossible that a prophet should die outside of Jerusalem.” (Lk. 13:33) We heard him in last week’s gospel telling his disciples that he would suffer greatly, be rejected and be killed and on the third day be raised. For the next four and a half months, every Sunday gospel will fit within St. Luke’s framework of what is called Jesus’ “journey narrative.” His journey would take him through Samaria, which as we hear in today’s gospel, was not very friendly toward the Jews. James and John wanted to punish the Samaritans who did not welcome them, but that was not Jesus’ way of doing things. The Samaritans would be the losers because they rejected Jesus. Who knows how many of their sick citizens might have been healed, or how many pearls of wisdom Jesus may have left with them if they had welcomed him. Next we have three sayings of Jesus that emphasize the attitudes that are required from those who would follow him, attitudes requiring sacrifice, sometimes sacrificing our comfort, pleasure and worldly security, sometimes having to put family obligations aside to honor our obligation to God, and always knowing we have to make time for our responsibility to obey and honor God. Among the freedoms we enjoy is freedom of religion. Our Constitution say: “Congress shall make no law respecting an establishment of religion, or prohibiting the free exercise thereof.” The Supreme Court has consistently held that the right to free exercise is not absolute. For example Mormons may not practice polygamy. A devotee of paganism cannot initiate human sacrifice. We live in a time where there are those who want to put more restrictions on the exercise of Christianity in general and Catholicism in particular. Just to name a few examples: a human fetus is not human enough to be guaranteed the right to life, a Catholic college like Notre Dame or Xavier is not religious enough to qualify as a religious organization in the Affordable Care Act. We are soon going to be taxed by being required to pay for birth control and for abortion inducing drugs, even though we are conscientiously opposed to them. The IRS will see to it. And what is one to make of the Supreme Court decision this week on marriage? There are many in our society who have no time for religion, who claim no religious affiliation and who consider religion useless, superstitious, antiquated, authoritarian and even harmful. As a people of faith and as a nation we believe that freedom is an unalienable right given by our Creator. As we have had to defend our freedom as a nation many times in order to preserve it, we have to defend our freedom as religious people and it is our right to do so. Amen. What we do to others we do to God. Sin takes us away from God. We are to seek holiness in our souls. into me Your virtues and gifts. Dear Father, Son and Holy Spirit dwell in me. ever greater to know and love supernaturally. From Tell My People by Fr. Edward J. Carter, S.J. 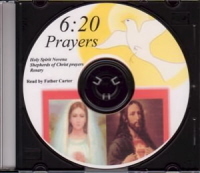 Jesus: "My beloved friend, tell My people to pray daily to the Holy Spirit. They are to pray for an increase in His gifts. My people must realize that the Holy Spirit comes to transform them. The Spirit desires to transform you more and more according to My image. Those who are docile to His touch become increasingly shaped in My likeness. He performs this marvel within Mary's Immaculate Heart. The more one dwells in My Mother's Heart, the more active are the workings of the Spirit. The Spirit leads Mary to place you within My own Heart. In both Our Hearts, then, your transformation continues. The more you are formed after My own Heart, the more I lead you to the bosom of My Father. Tell My people all this. Tell them to pray daily for a greater appreciation of these wondrous gifts. I am Lord and Master. All who come to My Heart will be on fire to receive the gifts of the Spirit in ever greater measure! I love and bless My people!" Reflection: The Holy Spirit is given to us to fashion us ever more according to the likeness of Jesus. And the more we are like Jesus, the more Jesus leads us to the Father. Do we, each day, pray to the Holy Spirit to be more open to His transforming influence? Do we strive each day to grow in union with Mary? The greater our union with our Mother, the spouse of the Holy Spirit, the greater is the transforming action of the Holy Spirit within us. Prayer: Come, Holy Spirit, fill us with your gifts of wisdom, understanding, knowledge, counsel, fortitude, piety, and fear of the Lord. As we dwell in the Heart of Mary, Your spouse, fashion us more and more according to the Heart of Jesus. being as God wants me to be. Holy Spirit be the Guest of my soul. Let the Spirit of God be in me. the Plan of God, Our heavenly Father. Sing: Come to me, Lord, and possess my soul. Come into my heart and permeate my soul. Help me to sit in silence with You and let You work in my heart. us more and more into the image of Jesus. 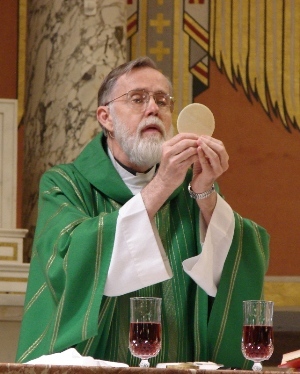 of Jesus in the Eucharist. Sing: Glory be to the Father, and to the Son, and to the Holy Spirit. As it was in the beginning, is now, and ever shall be, world without end. Amen. Do you not realise that you are a temple of God with the Spirit of God living in you? R. We consecrate ourselves to God. We give ourselves to the Hearts of Jesus and Mary. Come, Holy Spirit, almighty Sanctifier, God of love, who filled the Virgin Mary with grace, who wonderfully changed the hearts of the apostles, who endowed all Your martyrs with miraculous courage, come and sanctify us. Enlighten our minds, strengthen our wills, purify our consciences, rectify our judgment, set our hearts on fire, and preserve us from the misfortunes of resisting Your inspirations. Amen. Jesus came to deliver the Gospel message. I love to meditate on Mary's "yes"
doing the will of the heavenly Father. body, mind and soul to God. Mary said "My soul magnifies the Lord"
in Baptism and it must be fed. to authority designated by God. as children of the Heavenly Father. Mary is the perfect handmaid of God. to help build His Kingdom. of all animals wild and tame! The man named his wife 'Eve' because she was the mother of all those who live. think, but what we do before God. God is watching everything we do. In the sixth month the angel Gabriel was sent by God to a town in Galilee called Nazareth, to a virgin betrothed to a man named Joseph, of the House of David; and the virgin’s name was Mary. He went in and said to her, ‘Rejoice, you who enjoy God’s favour! The Lord is with you.’ She was deeply disturbed by these words and asked herself what this greeting could mean, but the angel said to her, ‘Mary, do not be afraid; you have won God’s favour. Look! You are to conceive in your womb and bear a son, and you must name him Jesus. He will be great and will be called Son of the Most High. The Lord God will give him the throne of his ancestor David; he will rule over the House of Jacob for ever and his reign will have no end.’ Mary said to the angel, ‘But how can this come about, since I have no knowledge of man?’ The angel answered, ‘The Holy Spirit will come upon you, and the power of the Most High will cover you with its shadow. And so the child will be holy and will be called Son of God. And I tell you this too: your cousin Elizabeth also, in her old age, has conceived a son, and she whom people called barren is now in her sixth month, for nothing is impossible to God.’ Mary said, ‘You see before you the Lord’s servant, let it happen to me as you have said.’ And the angel left her. she was always without sin. they came into the world without sin. Mary, Holy Virgin, pray for us. Joseph even though He is God. in the Mass Book about December 15th. R. Grace is His life in us. It is what is real! I long to unite in the deepest union with Him in the Eucharist. I long for the Mass. I long for Thee, oh God. My every moment, I join as I did to You December 15 under the cross, where I felt Your presence. You whisked me away, and I was totally absorbed in that moment of celestial union with You. For that time, I existed only in You, in the deepest union, and I was in this moment existing in You. The earth stopped, and I touched the heavens, all my bodily cares were existent in You. I existed in Your Divinity, my being was in You. There was no desire or wish or wanting, for in that moment, I had all I wanted in You. I was satisfied and wanted nothing but to remain in that embrace. You were the Being, and my being existed in You, but I was only as I was in You - merged in You, knowing and being in Your Divinity and being so full as to feel complete in myself. You are so enormous, and You surrounded me in a burning embrace, the presence of red fire. I was not little, or "nothing", but existed in this enormous power and being so complete! I touched eternity, and in that embrace, I knew all the waiting was worth the glory. You enveloped my being, and I was truly merged in the Divine Presence. I was merged in Your being. I existed IN You, with You, in the highest union with You, although I knew I was still distinct from You. I was fused and absorbed in You, feeling complete and satisfied. To describe this union is far beyond any work of my pen and paper. I pray for the reader of this page to receive the grace to share this experience with Him, I will now live for this union-to be forever merged In Him, to be One in Him, to reach higher perfection as I exist in Him, for He takes the lowly and gives to them a sharing in Himself. He merges with us and we exist in Him. The word "in" - I could write pages about. I long for the deepest union with Him, where I am swept up in the heavenly embrace of the Divine God, and I am IN Him. This is heaven on earth: to be merged as one with Divinity, although remaining distinct from God, to take our feeble hearts, our lowly status and to unite ourselves with the Divine, Almighty, powerful God and in this union to be meshed with Him, that His power dominates and our humanity reaches its heights of fulfillment in this union, in this oneness with Him. The word I have looked for is "oneness." I understand some of the meaning of the words "One in Him." Oneness is the word to describe this union of our humanity with His Divinity. The depth to which we could meditate on oneness with God is incomprehensible. In that moment, the earth stood still, and He, my Divine Lover, the Bridegroom of my soul, took me to Himself, and I knew the embrace of the Divine God. Nothing on the face of this earth can describe our union with Divinity. Oh, good God, that creatures are so ungrateful regarding Your divine love. I am so sorry. Let me help make reparation to Your adorable Heart. Please unite with me now that I may more deeply love Thee. Oh, Divine Lover of my soul, let me help make reparation to Your adorable Heart for the neglect and indifference against You. Song from Jesus: I come to you with greatest love. I am your loving Savior. I am your God. I died for you. I come to you this day. He allowed me to experience such pain in my heart - wanting Him so badly, so many times-and then on Dec. 15, 1995 - He gave Himself to me in the deepest union. Nothing satisfies the soul but Him. He wants the nuns and priests to love Him. He chose them to spread His love. Souls are hungry. They will only be fed with His burning love. Priests need to talk about Jesus' love for us from the pulpit. Priests need hearts burning for love of Jesus. This will feed the hungry souls - lip service love doesn't do it. We open ourselves up to God. Life is lived for this! and Fear of the Lord. 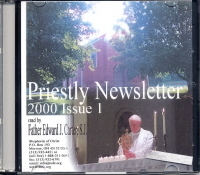 from Priestly Newsletter 2000 #3. Humility is a very important virtue given to us for the spiritual journey. Humility is both the realization of what we are as creatures of God and the concrete implementation of this realization in our Christian lives. Humility, therefore, is not an exercise in self-depreciation; it is not telling yourself that you are no good, that you really have nothing of any significance to contribute to the service of God. Humility is based on truth. It is compatible with the recognition that God has given a person certain gifts, even great gifts, of nature and grace. If we do not recognize our God-given gifts, we do not thank God for them as we should, nor properly develop these gifts according to His will. God wants us not only to recognize the good that is in us, but also to realize the source of this goodness. Although we have a responsibility to cooperate with His graces, God is the One Who is chiefly responsible for what we are. If one person has advanced to a level in the Christian life that is beyond the level of another, it is ultimately because God has given that person greater graces. If humility is based on truth and, consequently, allows us to properly recognize our gifts, it also necessitates that we admit to the evil within us, which is also part of the truth and must be acted upon. Humility not only bids us to admit that there is evil in us, but also tells us that, as creatures of God, we should conform to His will and work against this evil side of our persons. In summary, humility allows us to properly evaluate both the good and evil within ourselves. Here is a quotation from St. Paul which helps us to preserve, and grow in, humility: Who made you so important? What have you got that was not given to you? And if it was given to you, why are you boasting as though it were your own? (1 Cor 4:7). our Lord, and by this means to save his soul. be the way one lives! of loving God and others.